If Carly Fiorina were male, she would be regarded in national politics as an anti-Clinton crony capitalist who mismanaged a company when she was its CEO, was terminated by the company’s board of directors, was criticized for flying around in multiple corporate jets as she laid off many thousands of workers, became outrageously wealthy as a performance reward for the performance that led to her removal, and then turned her attention to politics which led to her being overwhelmingly defeated by Sen. Barbara Boxer (D-Calif.) in 2010, which was a banner year for other Republicans! Fiorina’s tenure at HP has been both criticised and defended. In 2008, InfoWorld grouped her with a list of products and ideas as flops, declaring her tenure as CEO of HP to be the 6th worst tech flop of all-time and characterizing her as the “anti-Steve Jobs” for reversing the goodwill of American engineers and for alienating existing customers. In 2008, Loren Steffy of The New York Times suggested that the EDS acquisition well after Fiorina’s tenure was evidence that her actions as CEO were justified. Fiorina has often been ranked as one of the worst tech CEOs of all time. After resigning from HP, Fiorina was named to several board memberships. She was named to the boards of directors at Revolution Health Group and computer security company Cybertrust. The following year, she became a member of the board of directors for chip maker Taiwan Semiconductor Manufacturing Company. She joined the board of trustees of the Massachusetts Institute of Technology and the Foundation Board of the World Economic Forum. She is an Honorary Fellow of the London Business School. In July 2012, Governor Bob McDonnell of Virginia appointed her to the James Madison University Board of Visitors. Unlike Mrs. Clinton, Fiorina has a resume based on hard work and achievement, mixed with more than a little success. Unlike Mrs. Clinton, Fiorina did not have to marry a cad to open her doors. After Fiorina’s departure, H-P remains a world leader and Fiorina business leadership remains in demand. Meanwhile back at the Little Rock Presidential Library and Trailer Park, the supposed charity the Clinton Global Initiative on manages to distribute ten percent of its revenue to its purported mission charity. I am not sold that Fiorina’s resume makes her a legitimate candidate for president. However unlike Mrs. Clinton’s resume, it does not make the case for a felony conviction. 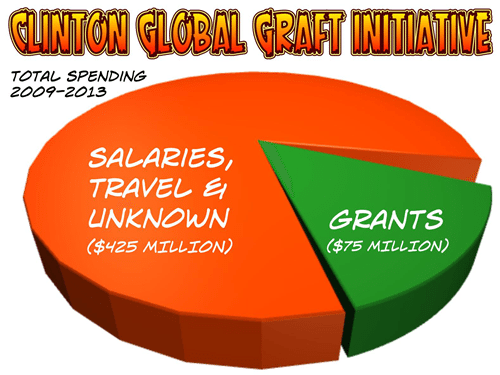 I don’t know what Mrs. Clinton’s role in the Clinton Global Initiative, but she either was complicit in or oblivious to an on going criminal enterprise conducted in her name.